It’s going to be sixty degrees today! What-what! Looks like yard work weather is upon us. I went to the garden center this weekend to pick up some flower beds and a few new planters for the balcony (this is finally happening!). The basic idea is to use an interesting container for the outside shape with something basic and smaller inside. Aren’t these pretty? I’m really loving the sort of corrugated edged ones especially. Those planters look amazing! 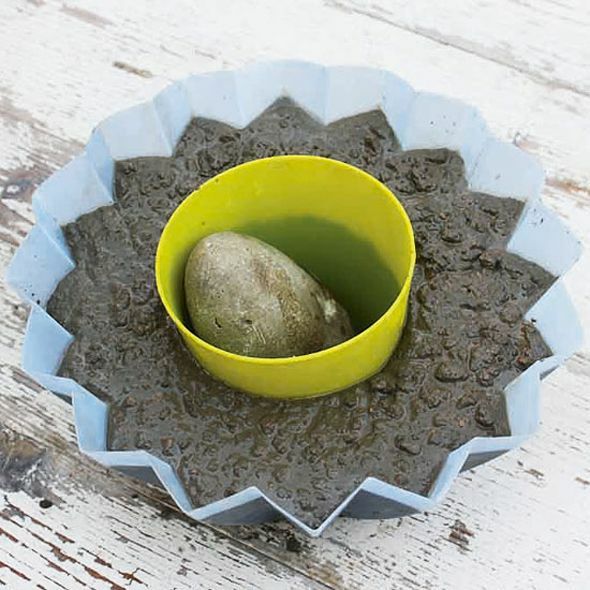 I am now very tempted to give it a go myself :)Did you coat the plastic moulds you used with anything to remove them when the concrete had set? I love the look of these! We have a leftover bag of concrete mix, and now I know just what to do with it. I love the shapes of each container. I have used concrete before and it will be easy, if you can bake bread you can mix concrete. I tried this last summer and it really is as easy as it looks! The only thing I found difficult was drilling drainage holes, no fun, so I'd really recommend using a cork or foam in the bottom as they recommend at the end of the instructions. Best of luck in your outdoor projects! You have to go back and get some flamingos! Those would be adorable with the playhouse. I've actually been eyeing some flamingo wallpaper for my girl's room. Qwikcrete makes a concrete for countertops that weighs a whole lot less. I'd return the concrete and get the countertop mix. 'jus sayin, Oh the frost date is May 15. You can buy the little plastic containers with corrugated sides from The Container Store for like $3. I have one from there. I wanted to try this project but never got around to it. my mom did a similar project – not planters per se. but she used hosta leaves to create little bird feeders. they are so perfect and look great. it was definitely worth the work vs. buying something made! Everything sets quickly so make sure you're project is all set up ahead of time before you mix. You can also dye the concrete or add stuff for a different look- shells, twigs, dried moss, rocks. And make sure you think about clean up. Anything spilled or dripped sets too. And of course don't go near a drain indoors or out. 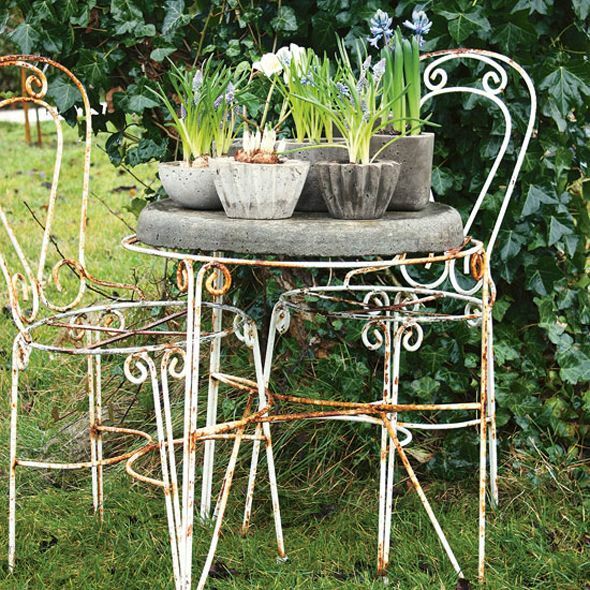 I haven't used concrete, but I'm thinking I might have to tackle this DIY too! They're so rustic and simple and beautiful. can't wait to see how they turn out! I love this! Something I am definitely going to try! Who can't love a girl who just "picks up a bag of concrete" mix & then goes home & uses it right away! The planters turned out great!! I want a big planter…wonder if I could use an old plastic garbage can as a mould…what do u think? Absolutely terrific planters. What a great line-up of planters. Looks so good. I could see a bunch of those around my new patio! These are brilliant! I can't believe you are making these!! I love all the shapes. Such a good idea. Terrific idea – can't wait to see how they turn out! I love this idea. Thanks for the reminder! I did use regular concrete a few years ago in pie pans just to make stepping stones with the kiddo. So easy! I can't wait to see how it turns out for you. I love the flamingos – you should definitely get some! My mom used to lead a craft at summer camp that was using bits of broken pottery and colored glass to make concrete stepping stones. You lay down the pattern (in reverse) in like a pie pan I think, then poured the concrete over. It was always fun to see how the designs turned out. I'm sure you could do something similar with planters (even along the top edge once the concrete has set up enough to hold them up? Hmmm… Are they any Home Goods in the city, or do you have to venture east for that? There's gotta be one in Nassau near Brooklyn, if nothing else. They have HUGE outdoor planters this time of year for a song. In fact, I'm fixing to head out to my Suffolk Cty Home Goods tomorrow for that exact reason! I imagine doing something super huge in concrete might be a bit unwieldy. If you want to go big, I can't recommend Home Goods enough for budget savvy planters. brilliant. totally giving this one a shot. i can't believe how pricey planters are! My girls were on errands with me one day a couple of years ago. The manager at one of the businesses said that they were getting rid of flamingos they had been using in their display and offered them to my children. 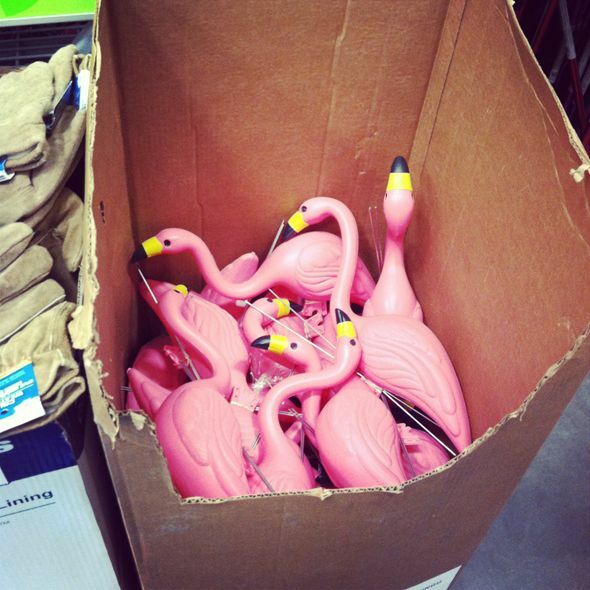 The girls grabbed them all, put them in the back of the car, and we have had a flamingo flock migrating around our yard every summer since. They are cute, fun, and so kitschy. Can u recommend where to buy the corrugated container and other fun ones? Thx! Can't wait to try this! I think her pots won't be quite as heavy. We had to stymie our dog from knocking her bowl over, so we filled the underside with quickcrete, and it was SUCH a chore to pick it up and dump it out. 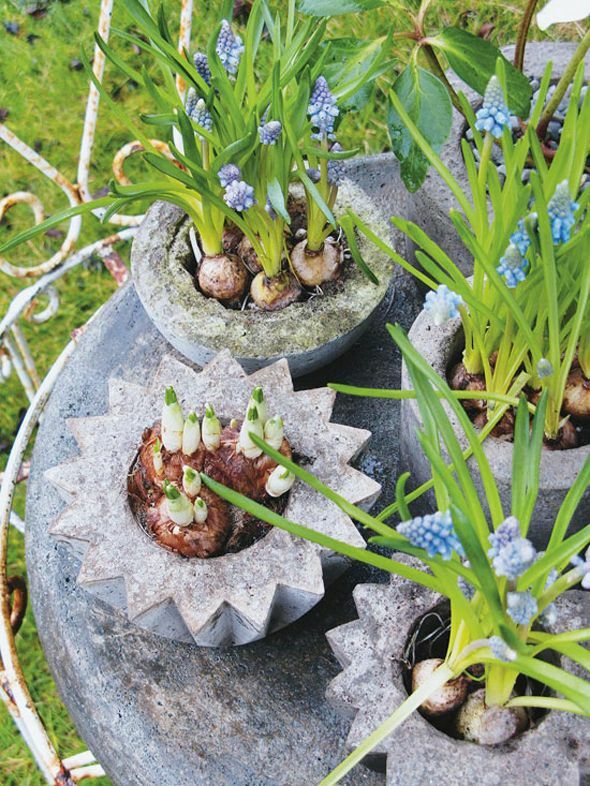 If you plan to move the planters or to make big ones, her tutorial might help lighten them up. I love your fearlessness to attempt new projects! 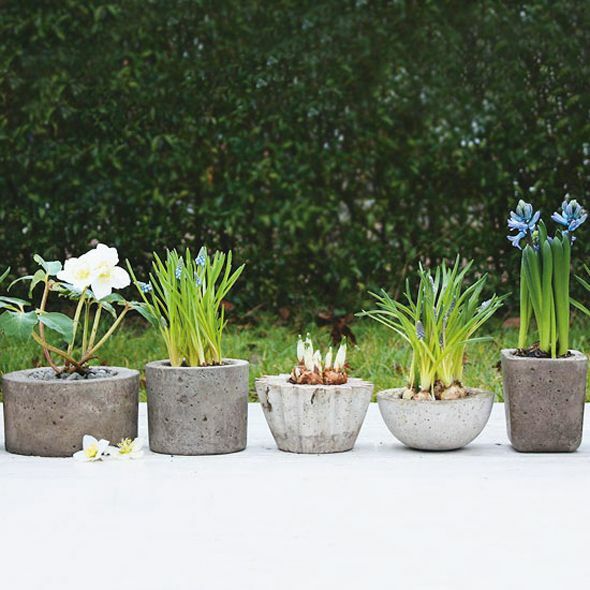 Concrete planters are definitely on my To-DIY list this spring. Got my seeds germinating (hopefully) in the windowsill for the last week or two. Going to need a home for them once they sprout. 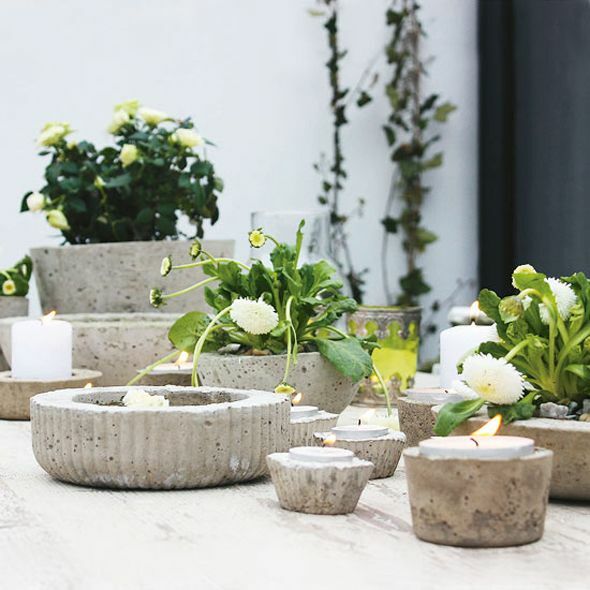 I love the economy of the DIY concrete planter – pound for pound the cheapest DIY out there I would guess. These look fantastic– I've been wanting to do this for awhile now– Great job! Love this! I guess I have to hunt down some containers with interesting shapes to use as molds. Hi Jenny – I think you did an amazing job with these – and I'd LOVE to include this in an upcoming DIY post to my blog this Tuesday. You are one talented gal – and I LOVE your page! Pls let me know if that's okay! Lightweight fiber concrete allows for larger pieces that can be easily moved, so possibilities are infinite.